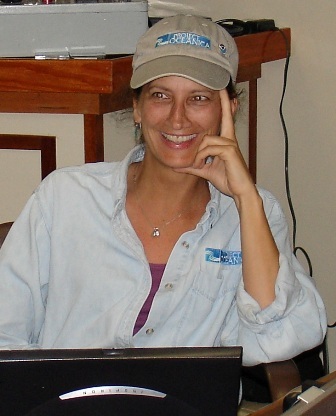 We try very hard to keep track of our 20+ Seafloor Mapping Program ("Beam Team") alums. while others have pursued alternate paths. Whatever path, we are proud of them all! See INSITE '08 Seafloor Mapping cruise with UW. Mike's commentary, "Once and Future Oceanographer"
Michael is trying to perfect the art of being a climbing bum in the Tetons and hanging out with his family. He just returned from a two week research cruise with the University of Washington, helping to map and characterize potential seafloor sensor locations and fiber optic cable routes for the NSF's Ocean Observatory Initiative (OOI). The Regional Scale Node Observatory (formerly referred to as the NEPTUNE Program) will remotely examine the physical, geological and biological processes of the Juan de Fuca plate. 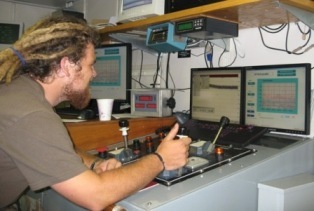 Dan worked for NOAA's Hydrographic Division after graduating in 2004. He sailed on the NOAA Ship RAINIER as hydrographic survey tech to survey coastal Alaska, then on the NANCY FOSTER to do habitat mapping in conjunction with National Marine Fisheries Service's invasive species surveys, cetacean surveys, and coral reef degradation surveys. 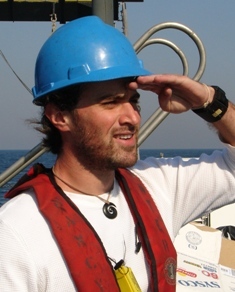 More recently, he worked on OSCAR ELTON SETTE as oceanographic survey tech in support of marine mammal research cruise, longline fishery survey, and cetacean tagging and tracking. "Still here! Gorka and I have been seeking additional funds to continue Transects at CofC and to 'grow' it elsewhere. We are grateful that CofC's President Benson has agreed to fund Leg 05 in Fall/Spring 2009/10! Since our last program (Leg 04) I've been able to work with NOAA to acquire ship time on the NOAA Ship Nancy Foster and establish our Seafloor Mapping Program. We have a terrific partnership with the CARIS software company that enables us to train several students at a time. The semester-long training coupled with a few days at sea of data acquisition has led to two successful 'Beam Teams'! Our third Beam Team sails in Oct. 2008 and will be in class during the spring semester. Brian is currently finishing up his marine biology requirements at CofC and will be graduating in May of 2009. After that he is looking for a research job and/or going to Grad school. He is currently working with Dr. Scott Harris, using the Geology Department's new side scan sonar and sub-bottom profiler to do a habitat assessment of an area on the 28 meter contour Northeast of the Charleston Jetties. Brian is also a NOAA Hollings scholar and spent summer 2008 with theNational Marine Fisheries’ Coral Reef Ecosystem Division in Honolulu, working on long-term monitoring of the US's coral reefs throughout the Pacific Basin. National Science Foundation Geoscience Education grant (GEO-0331155). and the College of Charleston Dept. of Geology. 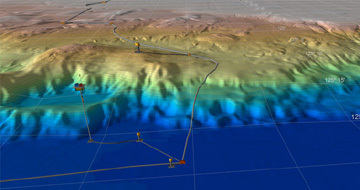 and by an Academic Partnership with the multibeam software producer, CARIS, Inc.
For questions or comments, e-mail Oceanica's Webmaster .